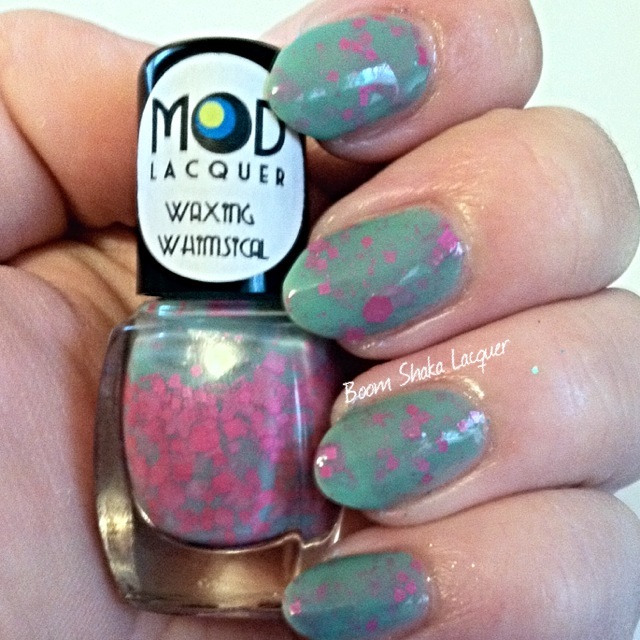 MOD Lacquer Review and Swatches! Hello my dearest and most wonderful readers! I have a fun post for you today as it’s a brand we haven’t seen around these parts in awhile! 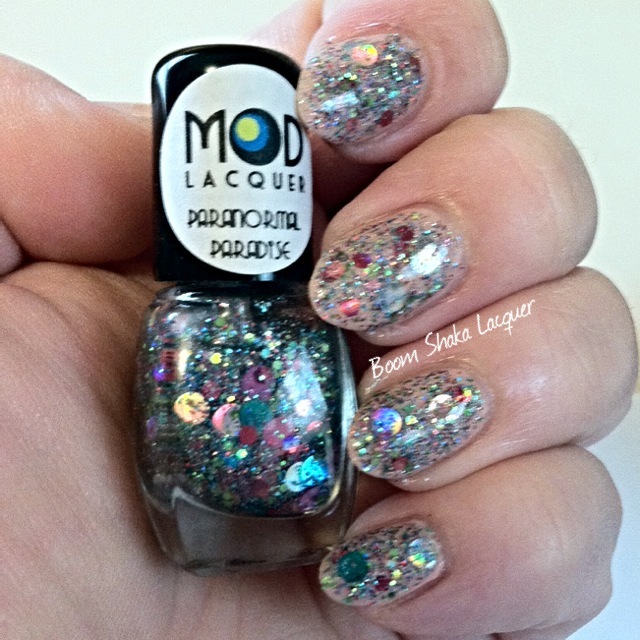 Now MOD Lacquer puts out some truly beautiful polishes. I have two holographic polishes and three of her new Electrified collection which is a gorgeous batch of neon cremes! Let’s start with the Neons shall we? I’d like to make a couple of notes before we dive into the abyss of…Er…I mean review. I’ve seen a lot of bloggers/swatchers/customers of the brand who have been marbling with these colors to very good effect. I received minis of these and as many know marbling with minis is extremely difficult so I didn’t attempt it more than once. 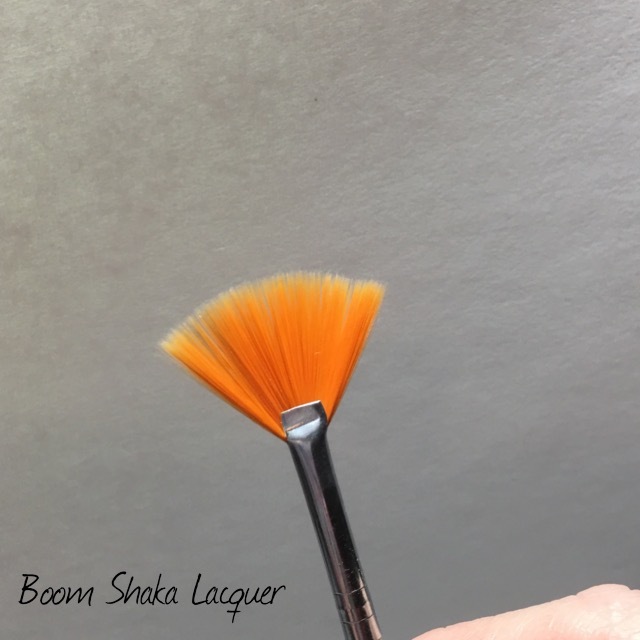 With minis by the time you get a good bead on the brush the first ring is a little too set. If you’re interested in marbling these WILL work well for that just make sure to get the full sizes! Secondly neons are notoriously hard to photograph and my pictures do not do justice to the full and amazing neonness that is these polishes. First up we have High Powered! 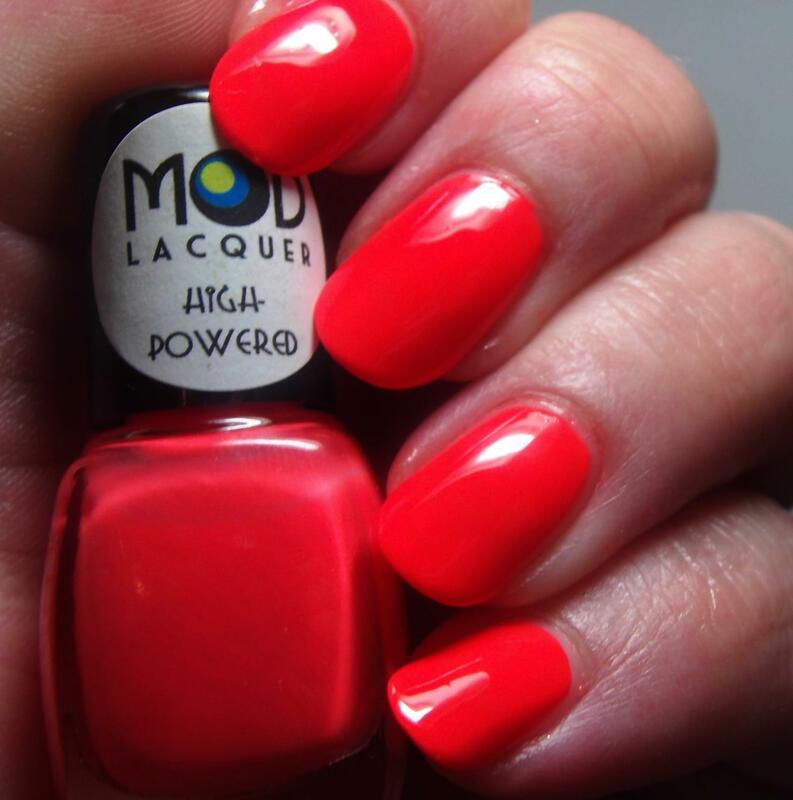 In this photo this polish looks more like one of the neon red colors however I assure you that High Powered is a Bright Neon true orange. 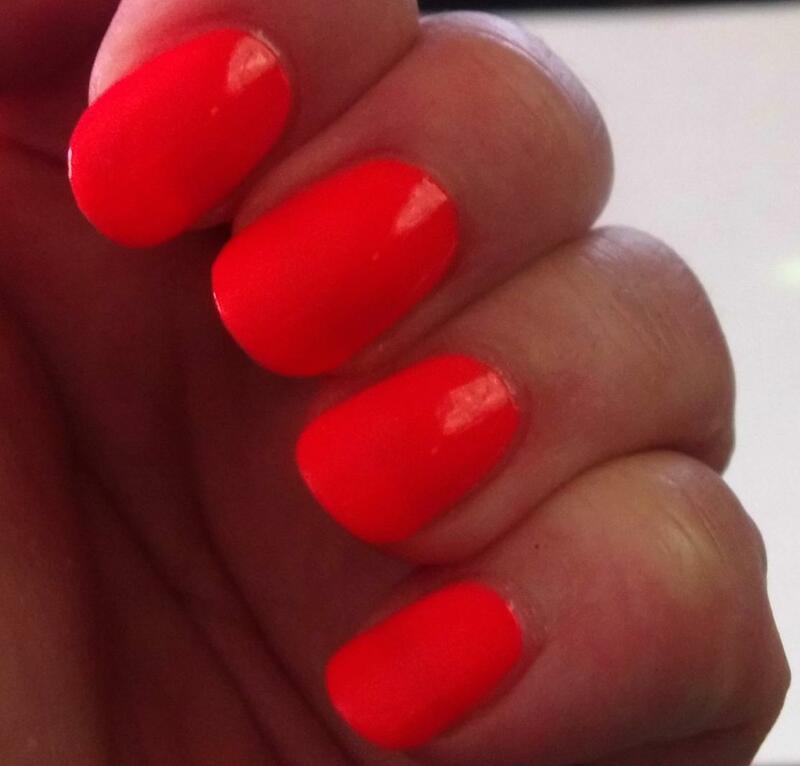 This shade is actually more like traffic cone orange than my pictures could capture! This is a smooth shiny creme that almost didn’t need topcoat though I put one on out of habit. The brightness of this is so satisfying. I crave neons they are some of my favorite colors! I know that this picture looks a bit dark I was trying to play around and get the best color possible. This is as close as I could get to the true color and even then it’s still tricky! Normally we would talk about formula here but all the neons I am reviewing today had the same formula so I’ll save that for the last one! Pictures show two coats plus topcoat. I’m stunned (see what I did there?) at how accurately this one photographed. It’s still a touch less bright than the actual polish is but the shade is correct at least! 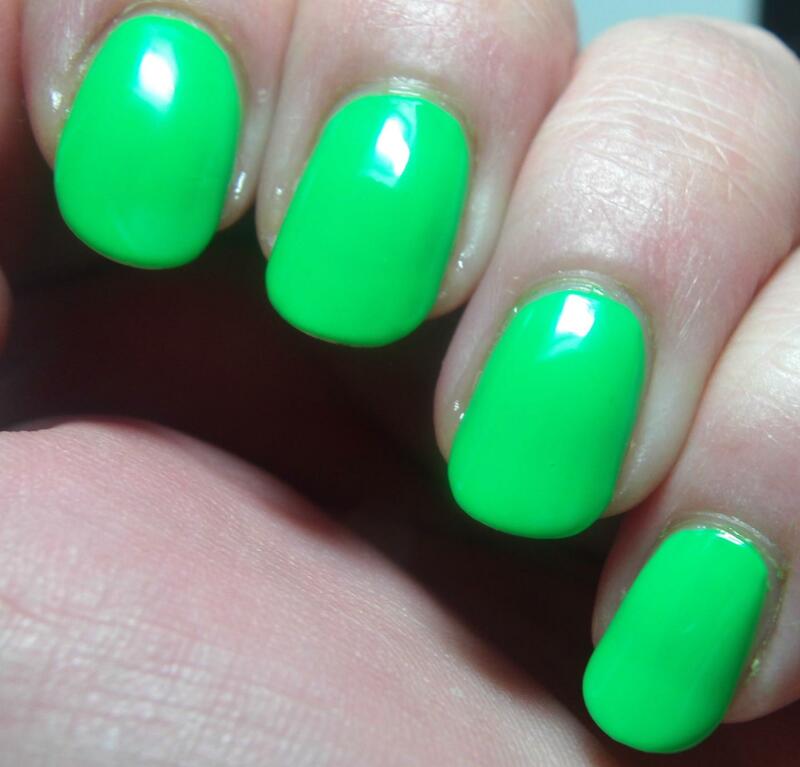 Stunned is a highlighter green creme. It’s definitely an eyecatching color and I seriously can’t wait to do some kind of nail art with these colors soon! Pictures show three coats plus topcoat because my nail line wanted to peek through the green moreso than the orange. Again justice for this color is not served…you can ALMOST see the actual color in the edge of the bottle. 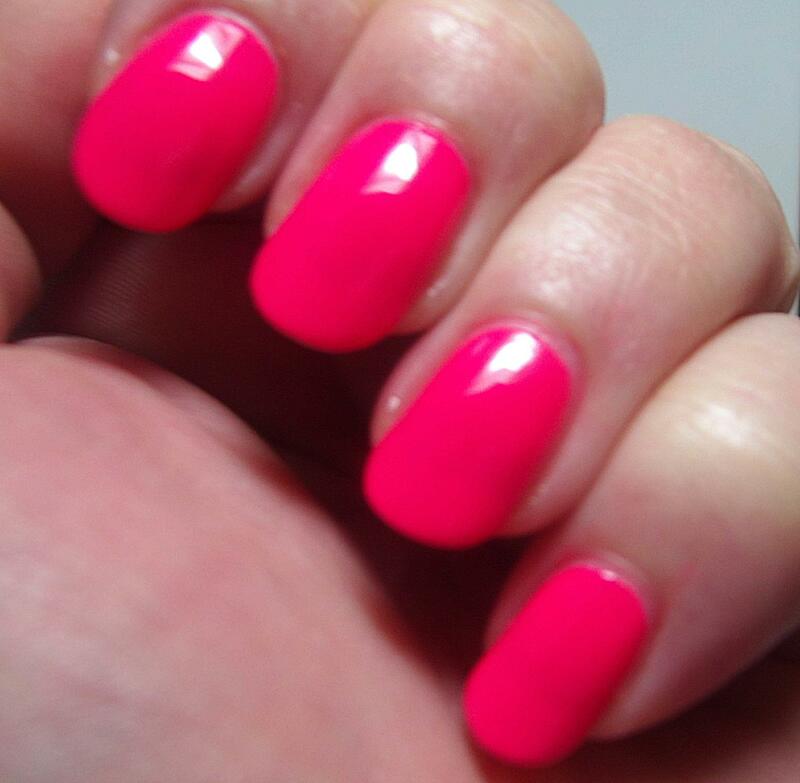 This color is a shocking, bright, neon, highlighter pink. Looooove this color this is my favorite of the three neons I received but together they work amazingly well! Like I mentioned before the formula on all of these was the same. Awesome! Here’s the deal pickles – neons are sometimes (frequently) a pain in the behind to work with or need to be layered over white to perform decently. 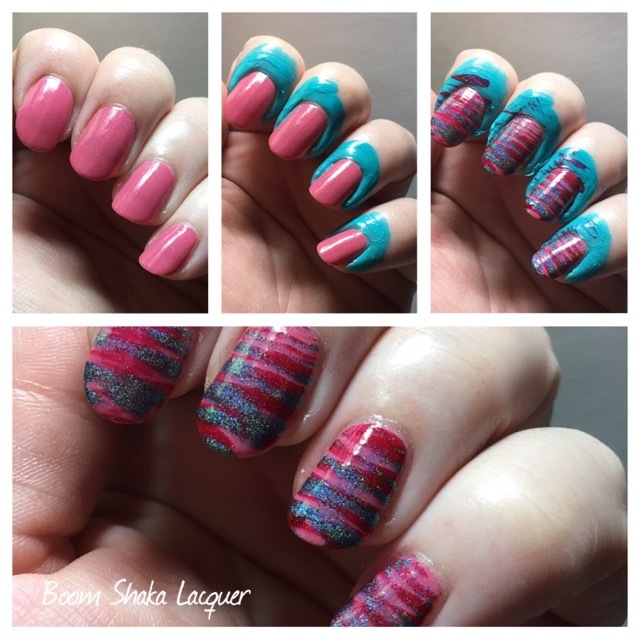 They can be hard to apply, streaky, hard to level and all sorts of unfun to apply. However I experienced none of this! 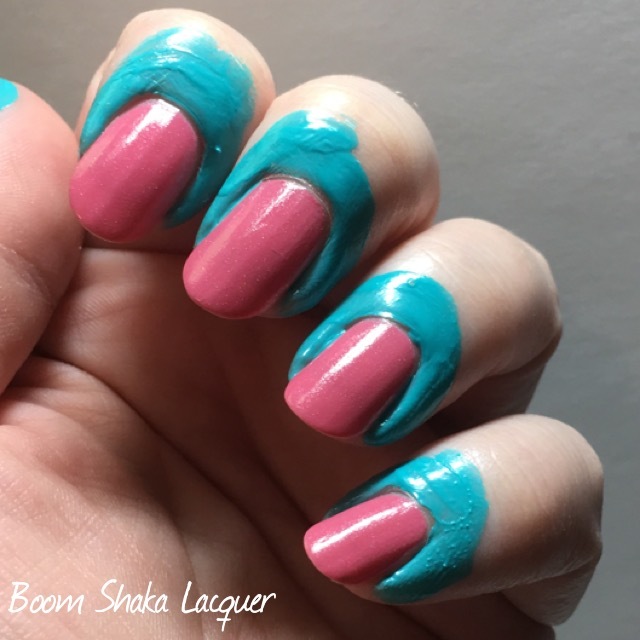 The only one that needed more than two coats was the green and that was more because the color itself allowed my nail line to show through rather than the formula itself. All of these cremes self-leveled and are shown on their own without undies. For neons they are truly delightful! 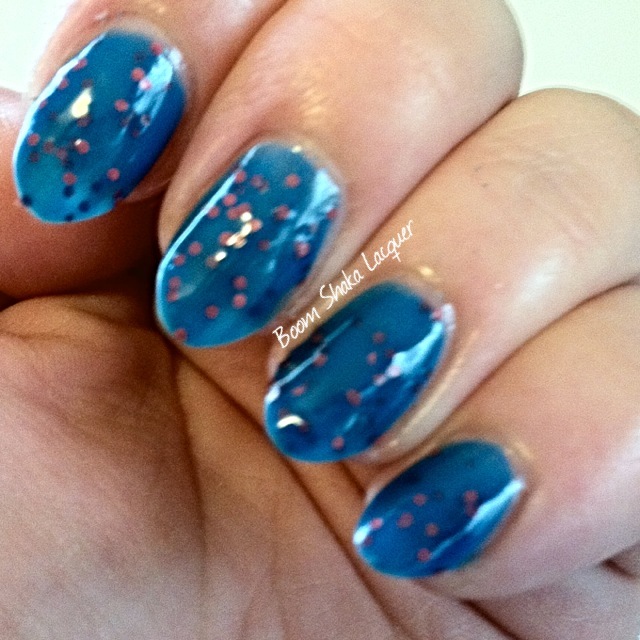 I topcoated them moreso out of habit than need and they look just awesome alone and will be AMAZING for nail art. 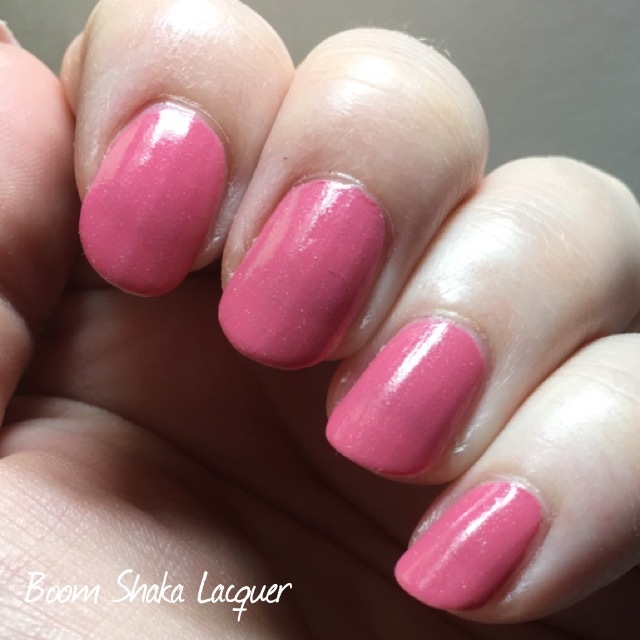 Baby Flamingo is a perfect flamingo pink, pink with a touch of orange undertone – almost salmon but not quite…it’s still definitely pink, creme holo. The holographic effect in this is fairly low density so it’s a much more subtle effect, more of a holographic shimmer if you will. It’s a gorgeous color and is great to have if you want some saturated color but have to keep to a “traditional” color pallette for work. It’s also great for nail art as I’ve already used this polish in that capacity as well! 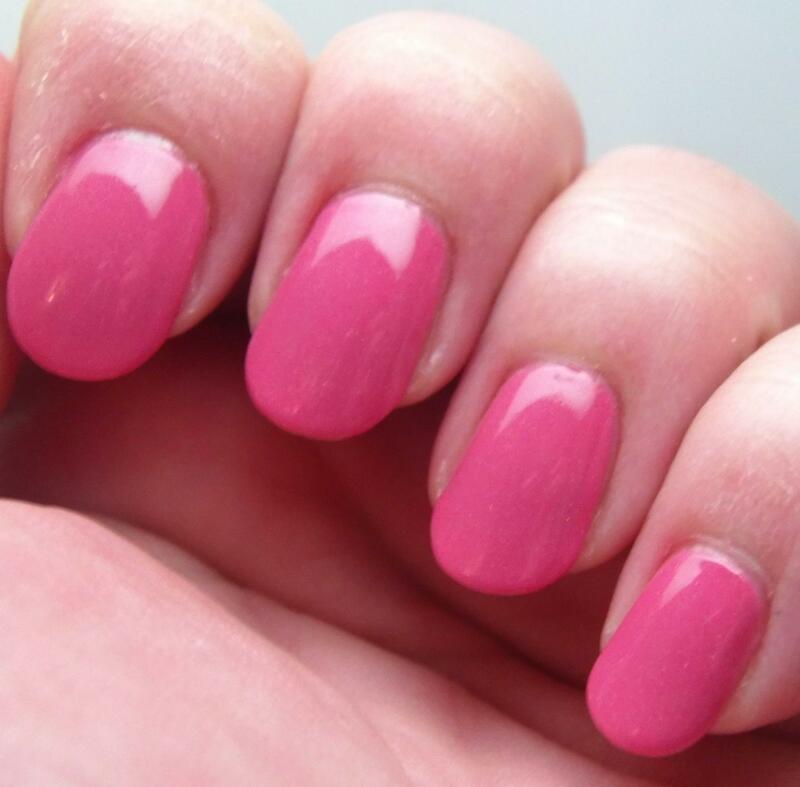 Because of the creme base for this polish it’s stunningly easy to apply and self-levels beautifully. It was opaque in two coats without any issue whatsoever. This one also almost didn’t need a topcoat as it dried very shiny but I threw one on out of habit! Pictures show two coats plus topcoat. 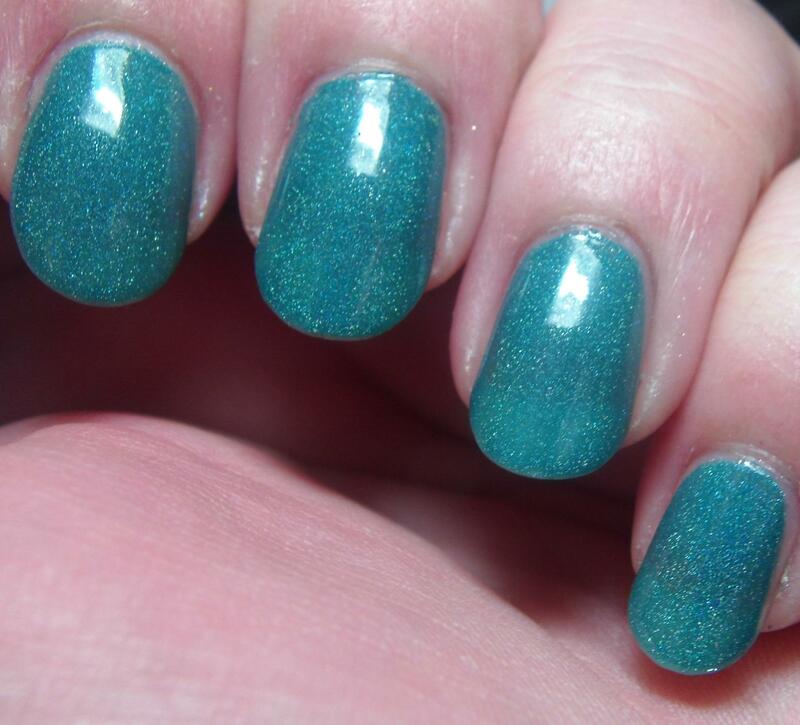 Aerodynamic is a gorgeous medium turquoise creme holographic polish. As I’ve said a million times and as ya’ll are probably sick of hearing about I love holographic polishes that have a little bit more going on with them and this one has a strong gold shimmer that keeps this from going too cool or gray due to the holographic pigment. I’m absolutely enamored of this shade! Formula on this is just luscious and perfect and everything I would want from a polish. Perfect in two coats with a good holographic arc, you can even see a bit of it in these pictures in my interior light. I can’t wait to see it in the sunlight! 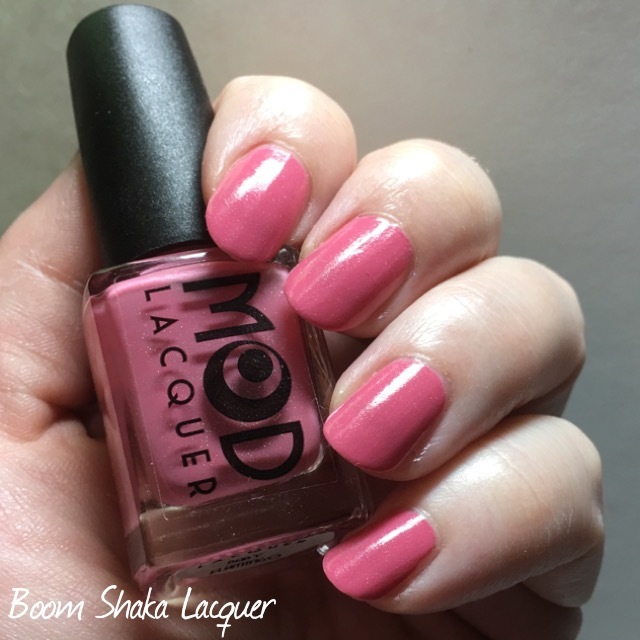 Now for all the details you need to snag up your own batch of MOD Lacquer! 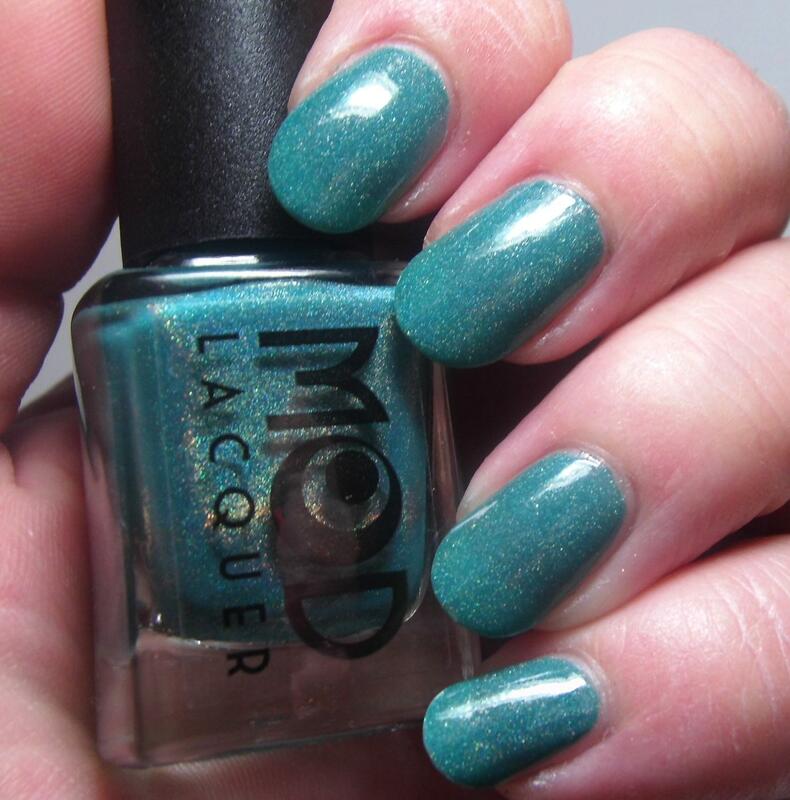 Naturally you can buy MOD Lacquer in their Etsy Shop. 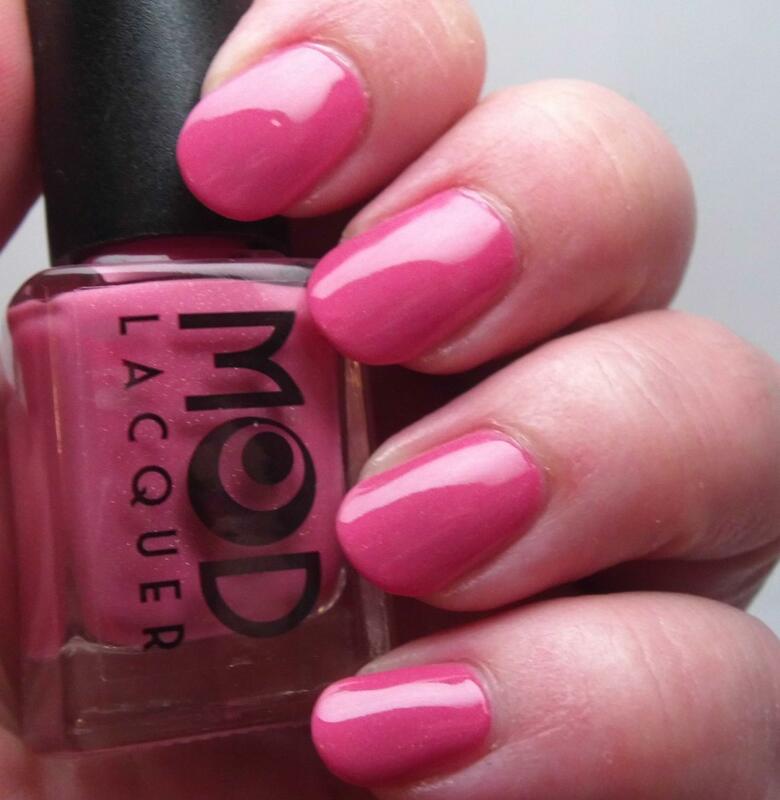 If you want to keep up to date and see lots of pretty nail polishes you should definitely follow MOD Lacquer on Facebook, Twitter, and Instagram. Go check ’em out! Hello my lovelies! I want to first thank you for being patient with me and my spotty posting schedule here lately. I’ve been right in the middle of the end of semester, the holidays are here, and I’m going to try to pick up some extra hours at work during my school break. So thank you! Second because of my somewhat spotty posting schedule I’ve had these pictures in the vault waiting for a moment to be released out into the world to inspire wishlists everywhere! 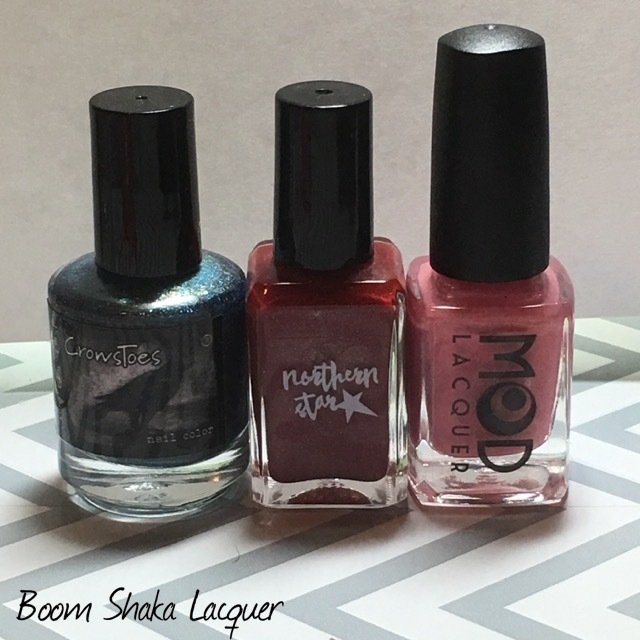 I have three delightful polishes from Mod Lacquer today! Let’s get started, I’m ready to roll! First up I have Waxing Whimsical! Isn’t this fun?! I adore colors like this. I tend to be very drawn to bright pastels and bright colors in general. This is a bright mint green crelly based polish packed with multi-sized matte hot pink square and hex glitters! It would almost be a jelly base if it were a little more translucent. It does go on a bit sheer but three thin coats and it’s all good. I didn’t have any problems getting the glitter, even the larger sizes, out onto the nail. The glitter spread nicely and didn’t require any major manipulations. I do recommend doing your first coat especially thin and not to worry about getting too much glitter on in the first coat or two – that could cause the glitter to clump up and need a lot of manipulation if the upper layers of glitter are catching on the glitter that has already dried a bit. Bottom line: I love this polish, the colors are perfect for me, the formula was really nice and I would totally recommend it! Next up we have the one that I thought was going to be my favorite from the bunch – I was wrong but I still love this one too! I present to you Radical! Let me say – this is another polish that is right up my color alley as it were. I ADORE blues, greens and teals. I do wear other colors but I really am drawn to that part of the color spectrum! 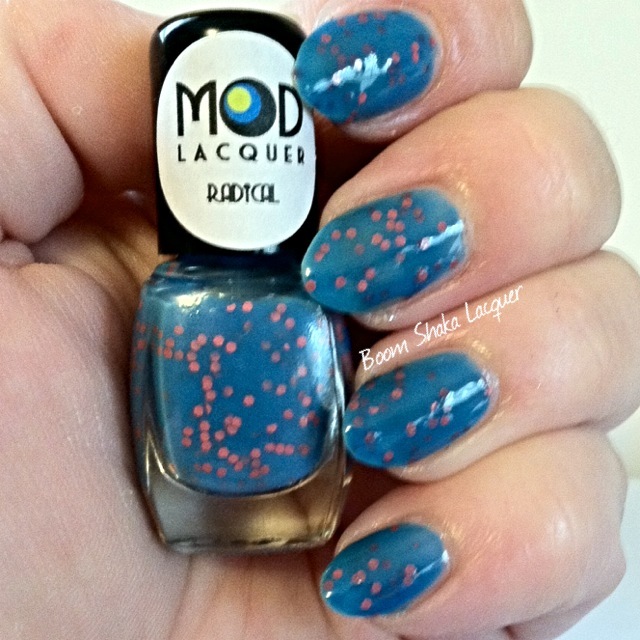 Radical is a bright blue crelly based polish with tons of tiny matte hot pink hex glitters meandering through the base. Again this is a crelly that could almost be a jelly if it were slightly more translucent. It is sheer like Waxing Whimsical but again this is three thin coats and it shows only the barest amount of VNL. As you know a little VNL never bothers me. 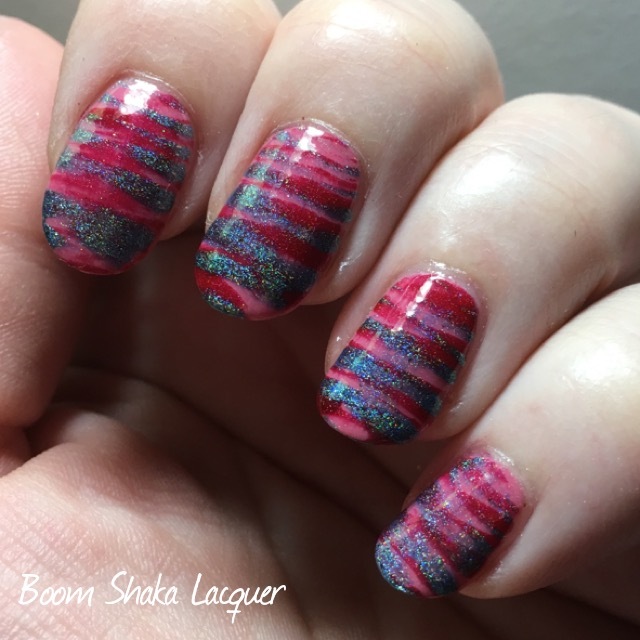 I like the squishiness, and I do not like to layer crellies and jellies over solid opaque polishes because they seem to lose that quality to me. This polish went on like a dream. Seriously, one of the easiest glitter polishes to apply. I really love the color on this one and I’ll definitely be reaching for it to overcome any winter doldrums that I may feel as the season wears on. Ok last but certainly not least is my favorite of the three I picked up – Paranormal Paradise! O.M.G. 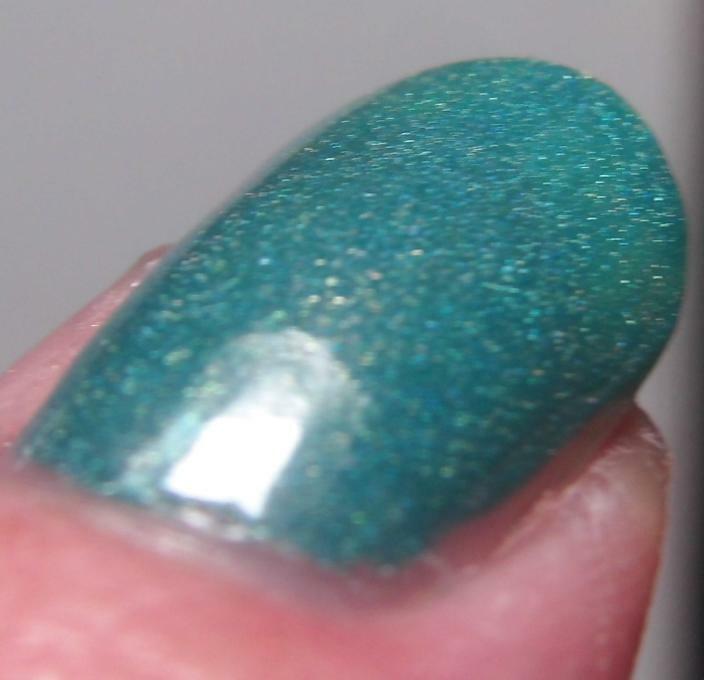 This is a clear based glitter topper. 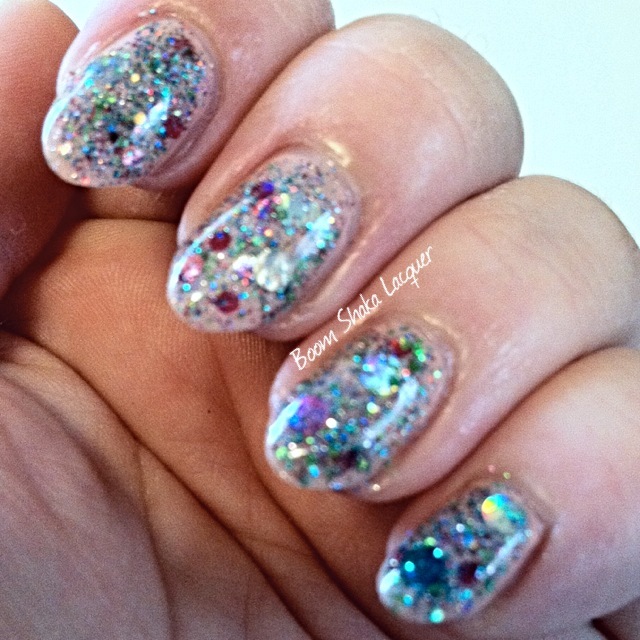 The amount of holographic glitter in this amazing polish is simply EPIC. 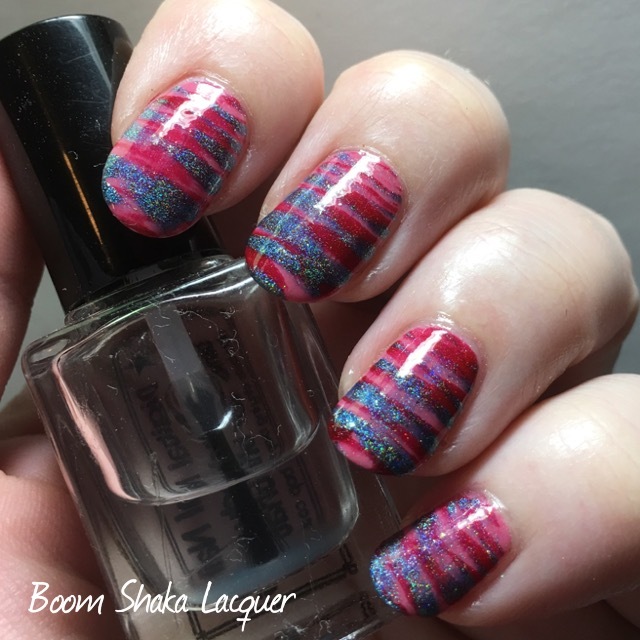 Being clear based I did layer it over undies but honestly what you see is one dabbed coat…I think I could have build this one to opacity if I wasn’t hoarding up my bottle like a crazy polish lady! Packed into the clear base is BIG holographic pink, silver, hot pink, and aqua circle glitters, medium metallic red and pink hexes, tiny metallic lime green hexes, and throughout is fine holographic multi-colored micro-glitter. There is so much glitter my camera really was freaked out and didn’t know where to focus! No digging or fishing was required, but I did turn the bottle upside down for about 20 minutes before I did this swatch. 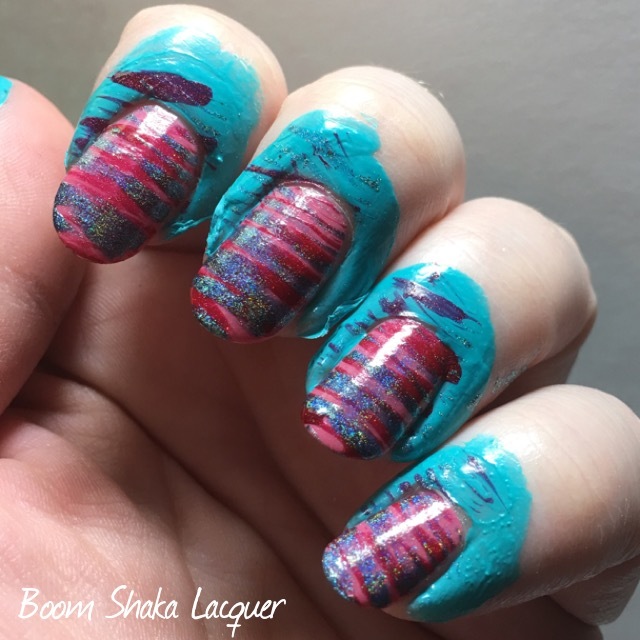 I do this with almost all of my glitter polishes, gravity helps pull the chunky bits up to the top where the brush can catch them more easily. This polish is crazy festive in my opinion and would be great topped over black, gray, or navy for the New Year! 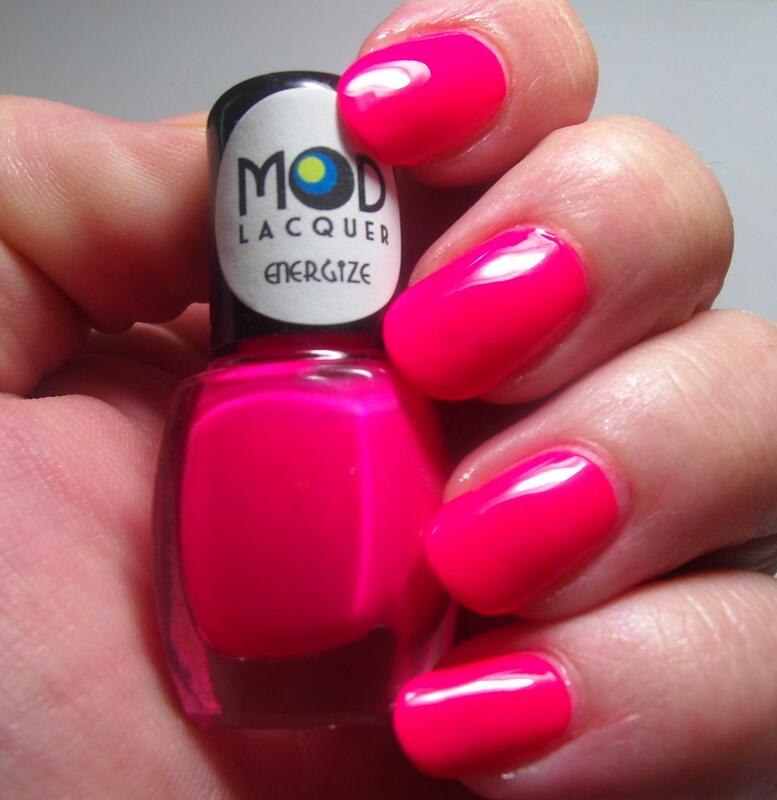 So…will you be running out to pick up some MOD Lacquer? I know I’ll be getting some more I’ve been really eyeing up her Cryptid Collection! You can of course keep up to date with news and sales by following Mod Lacquer on Facebook and you can buy her polishes in her Etsy shop! 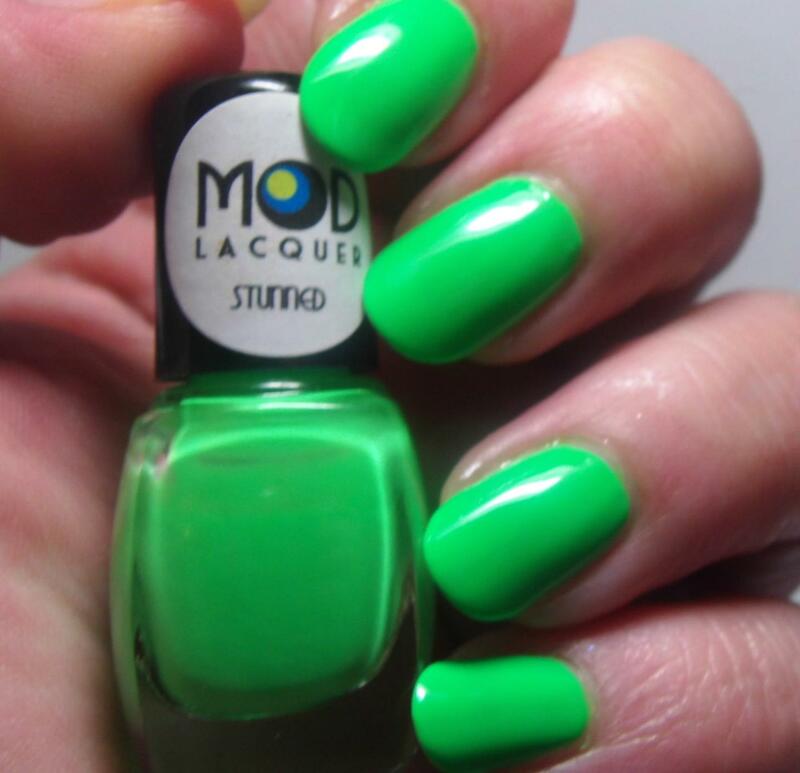 This entry was posted on December 11, 2013, in Indie Polish, MOD Lacquer.